Looking for yummy healthy lunch box fillers? 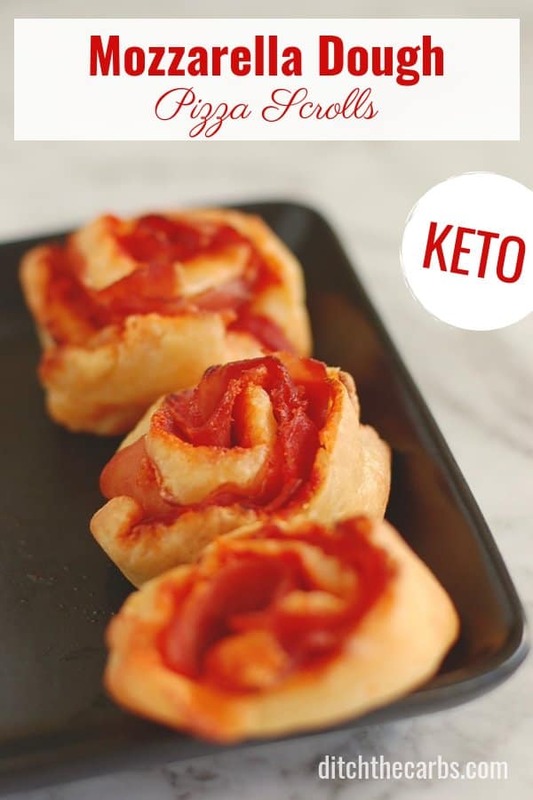 Well, Mozzarella Dough Keto Pizza Scrolls are the perfect solution! And everyone will dive for them picnics or served for party nibbles. 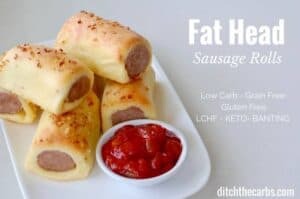 The simple keto recipe can be made with almond flour or coconut flour and it’s only 1.9g net carbs each (makes 8 scrolls). If you or your kids absolutely love pizza, and you wish you could have it for your school or work lunches, then you will definitely want to give this easy mozzarella dough recipe a try! 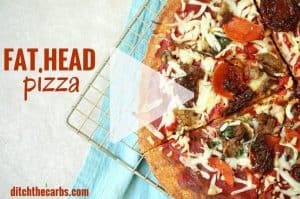 It’s a fun spin on your typical pizza AND it’s low-carb and keto, too! 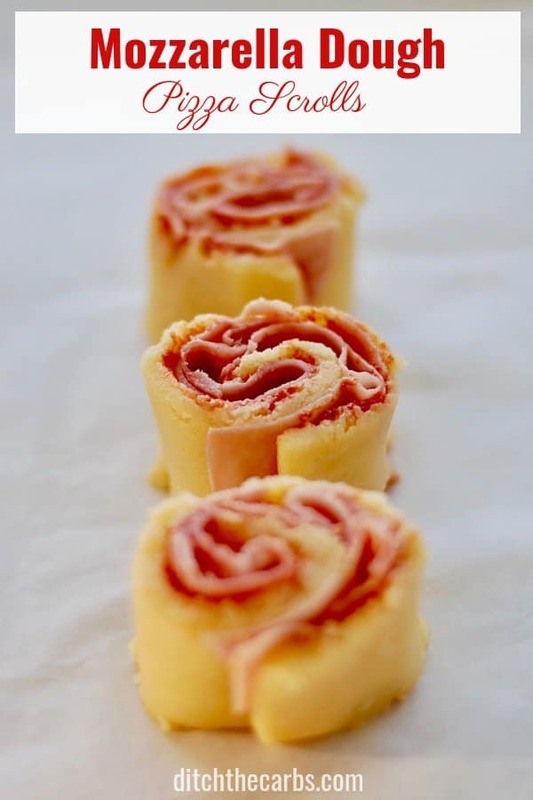 Keto pizza scrolls are compact and easy to pack for an on-the-go meal. You can add your favourite pizza toppings inside the mozzarella dough, roll em’up, then cook the pizza scrolls in only 15 minutes. Once you discover mozzarella dough, there is no turning back! It is so easy and so versatile. It can be baked sweet or savoury and is not much more than mozzarella cheese, an egg, and some low-carb flour. My recipe even comes with instructions on how to use almond flour OR coconut flour (and if you have been low-carb or keto for a while, you will know these two flours cannot be substituted easily. If you are new here, why not read my Ultimate Guide To Low-Carb Flours. The original recipe for mozzarella dough was called Fat Head dough. Why? Because Tom Naughton first published the recipe, and he is the creator of Fat Head, the movie. So credit where credit is due. Tom’s recipe is now infamous in the low-carb and keto world. 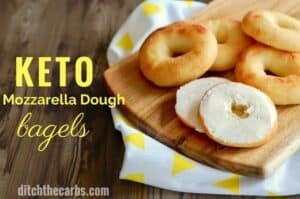 Scroll below and you can see all the recipes I have created using this classic keto dough. You simply melt mozzarella dough with some cream cheese, then mix in your choice of low-carb flour and an egg, then roll out in between two sheets of baking parchment. Once you have the mozzarella dough rolled out, spread all your favourite pizza toppings inside, roll it up, then slice into small slices. Next, place each keto pinwheel onto a lined baking tray, and bake at220C/425F for 15 minutes. And why not sprinkle with even more cheese or herbs before baking? It will turn into a yummy crispy topping. This recipe can also suit your preference whether you would like to use almond or coconut flour. Now, all that’s left is what you’ll top them with! So, go on and get creative! Add the egg and salt, mix gently. 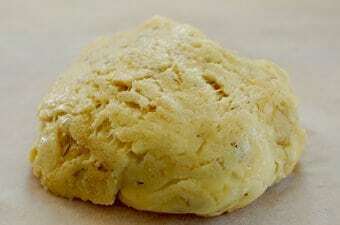 Place the keto dough in between 2 pieces of baking parchment/paper (see photos above). Remove the top baking paper/parchment and cut into a rectangle shape. Spread tomato paste over the prepared dough. Add slices of ham or pepperoni and other favourite fillings. 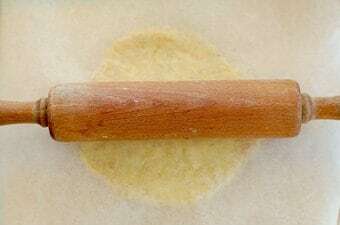 Roll up tightly using the bottom sheet of baking parchment. Cut into slices and place each one on a baking tray (cookie tray), and bake at 220C/425F for 12-15 minutes, or until golden. Nutrition panel is for base only as toppings will vary widely depending on what was added and how much. If you don't have a microwave, you may melt the cheese together in a saucepan on the stove top gently. 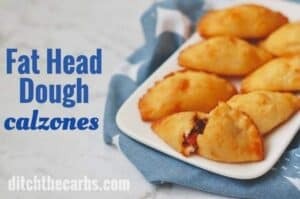 If you love mozzarella dough (aka Fat Head dough) then you will love these. Simply click on any link to go to the recipe. Why not print and save them for later? 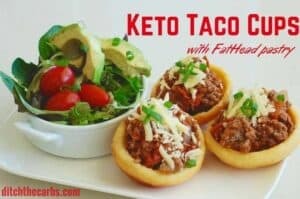 Keto taco cups – I am yet to find anyone who doesn’t love these babies! 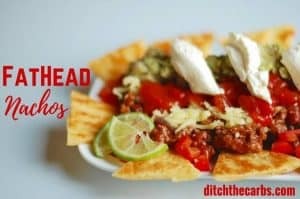 I LOVE this recipe but have 1 problem. I cook with coconut flour following the recipe but my resulting product comes out spread and flat – they are more pizza disks versus pizza scrolls. 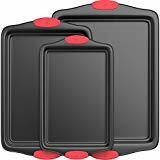 Mind you they are delicious regardless of the shape but I would like the scroll form. I’m pretty new to using coconut flour and am wondering if anything can be added to give the dough a former product. Any ideas? I bought tomato paste but it has 3g of sugar because apparently my town doesn’t have no sugar added tomato paste ugh. Would it be still considered Keto if there is a bit of sugar in the tomato paste?? Tomato paste will never be completely sugar-free because there are natural sugars in tomatoes and when they are concentrated into a paste, they will become concentrated also. No food is truly keto or not keto, it’s the amount you have and whether you are in nutritional ketosis. I use tomato paste because you can use so little yet get so much flavour. Hi, I want to try but we don’t find this cheese in france, what can I use ? You should be able to find mozzarella (buffalo) cheese in France. I know I have bought it there many years ago. This brand looks like it is available for you. This dough was actually not created by Tom Naughton, but by Cooky at http://cookyscreations.blogspot.com/2012/06/holy-grail-of-ketolow-carb-pizza-crust.html. Libby, this looks so delicious! 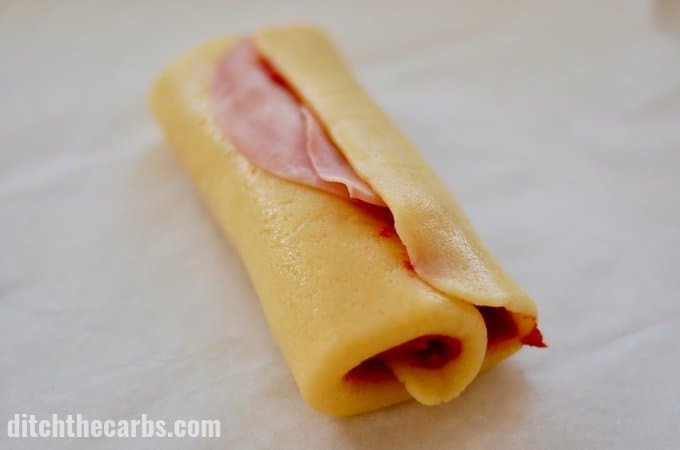 I’m thinking of this as more of a meal instead of a snack, so I’m curious… have you ever baked this as a pepperoni roll and not sliced into the smaller scrolls? I love the pepperoni rolls at the Pizza restaurants and would love to find a good alternative to that! Oooh, this is a superb idea! I’ll definitely be giving this a go. Would you please translate your grams into cups/tsps etc.? All the recipes have large red buttons below so you can switch between grams and cups 🙂 Yay! Beware pre shredded cheese in the US (not sure about the rest of the world). Here, its packaged with potato starch or other carby stuff to keep it from sticking together in the bag. Read your labels. I buy the whole block and grate it myself. Hey Libby just wondering what you use to calculate your macros. I know you don’t recommend the my fitness pal app so I’m wondering what is best? Sorry if you see this question more then once I seem to be having trouble posting it so iv written it 3 times. I use cronometer.com which has all the official databases and is very accurate. You’re right, I personally don’t like MPF as there are too many user-added entries and depending on the country of origin of foods, the nutrition panel may show either total or net, but it may not be clear and therefore lead to very inaccurate calculations. Oh, Rebecca, this is exactly what I needed to read today after a very rude comment was left about a recipe (that I reviewed from a cookbook) and he even admitted he didn’t even try it!!! I absolutely love the stories and testimonials I am receiving each day. It truly makes me want to work all day long and start so projects to help you all.